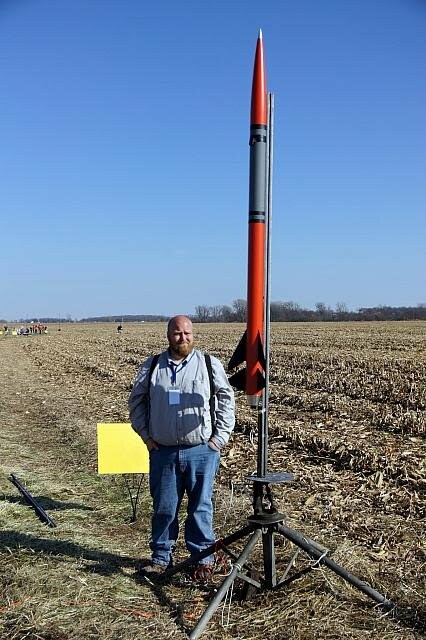 NAR Sections exist to fly rockets as a group effort, and it takes launch pads, electrical ignition controllers, and other equipment to run a safe rocket launch for a group. Even a “misfire alley” range setup where people bring their own launch systems (see the section on “Running Launches”) needs some support equipment. A public address system to provide the Safety-Code-required warning of impending launches and/or air horns to provide a “heads up” warning to people of unsafe situations. Folding-leg tables to accommodate the launch control panel and PA system, and to serve as working tables for safety checkin and other range administrative functions. Fire fighting equipment such as a pressurized water or an“indian pump” fire extinguisher (the best kinds for grassfires) and fire swatter or fire rakes to smother grass fires. A foldable “E-Z Up” type of canopy to provide shelter from the sun or weather for the RSO and safety checkin. Flag line or caution tape and 3-4 foot tall stakes to establish a “do not cross” safety perimeter around the launch area to keep spectators at the required safe distance. Signs to indicate where rockets are to be safety checked, and to provide any local field rules that spectators must be aware of. For Sections, any of this capital equipment, and particularly the equipment associated with safety, can be funded through a NAR Section Grant (see the Section Guidebook “Management” page for details on the terms of these grants). Acquiring, doing maintenance on, storing, and transporting the equipment for a Section range can be a big job. 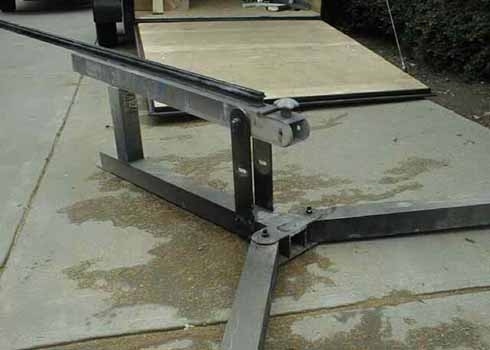 Splitting custody of the equipment between multiple individuals can lead to real problems if one of them does not make a launch, so this generally means one person has it all — unless the Section becomes big enough to afford a trailer that can be used to store the equipment between launches and transport it to launches. Even then, somebody has to tow the trailer. The volunteer who handles a Section’s range equipment is truly an MVP among the Section’s volunteers who deserves thanks and recognition from his fellow Section members! It is also a job that should be rotated periodically if possible, to avoid volunteer burnout. Pratt Hobbies sells a multi-pad launch controller that can support up to 6 separate launch pads or a 6-position rack-type launcher. Whatever the technology of the launch control system, it needs to deliver at least ~15 amps of current to the clips at each pad that it serves in order to reliably light heavy (HPR) igniters or clusters of model rocket igniters. With a standard car battery as the power source (~12.8 Volts), located at the launch control panel, this means that the wires from the launch controller to the pad (if they are 10 meters long) need to be no less than 16 gauge (based on resistance to current flow including the battery’s internal resistance), and preferably 14 gauge (based on heating from a long firing pulse). If the pads are just 5 meters away then 16 gauge wire should be OK. It also means that for high-power pads located 100 feet to 500 feet from the launch control panel, the firing battery needs to be close to the pad and the launch control system needs to control a firing relay near the pad rather than being the direct source of the firing current. Plans and instructions for a 10-pad rack-type launch system with controller were published online by Makezine. 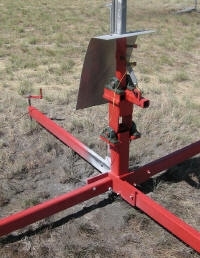 The photographs below show examples of model rocket range equipment such as rack-type pads for multiple launch rods and built using sawhorses or PVC pipe. Most of this equipment is designed and built by individual fliers; few systems are available from vendors, and unfortunately rocketeers are much more diligent about writing up plans for their rockets than they are plans for their rocket launchers! 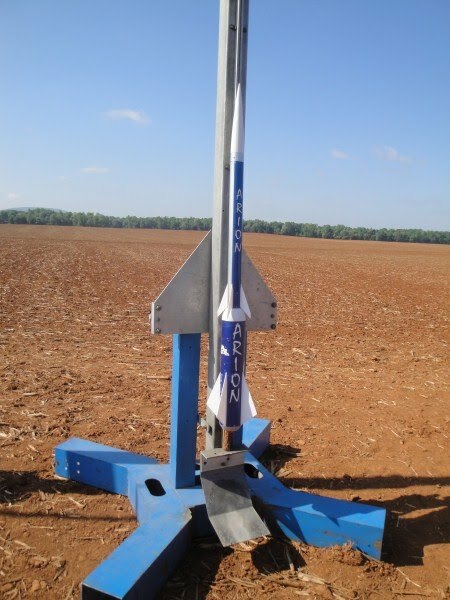 6-Position Launch Rack – notice the clay pot blast deflectors? Apogee Components published the plans for an inexpensive rail launcher suitable for mid-power and lower-end high-power rockets in their Newsletter Issue #235. Knight MFG makes heavy duty launch pads suitable for mid-power through low-end high power rockets. Below are some examples of mid-power range equipment: Larger individual pads for rockets using F through G or H motors that are too heavy to use standard launch rods. Giant Leap Rocketry sells some of the key components (rails, rail stops, etc.) for HPR launch systems.